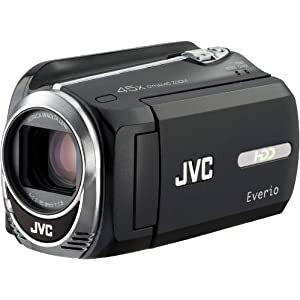 JVC GZ-MG750 80 GB HDD Camcorder; 11/6-inch 800k pixel CCD, 80GB Internal Hard Disk Drive for up to 100 hr. of recording, 19 hr. of the best quality recording (ULTRA FINE), 45x Dynamic Zoom / 800x Digital Zoom, Memory Card Slot for microSDHC/microSD, Laser Touch Operation with Sub-trigger and Zoom Function, Software provided (for Windows), KONICA MINOLTA LENS, HD Gigabrid Premium II Engine, One Touch Upload to YouTube (HD Compatible), One Touch Export, Auto LCD Backlight Control, Auto Illumi. Light, Data Battery, USB2.0 High-Speed Transfer, Super LoLux, Advanced Image Stabilizer,Time-Lapse REC, Auto REC.